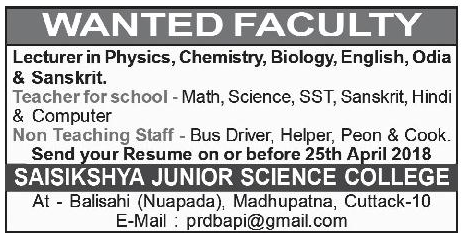 Saisikshya Junior Science College, Cuttack has advertised in Samaja for the recruitment of Lecturer jobs vacancies. Interested and eligible job aspirants are requested to apply with in 25th April 2018. Check out further more details below. About College: "SAISIKSHYA JUNIOR COLLEGE" offers a two years full time higher secondary certificate course. The total intake for the program is 192 students per academic year. The program is recognized by Govt. of Odisha and is affiliated to Council of Higher Secondary Education (CHSE), Odisha.